Linda Tremaine heard a tap on her office window today around noon. She saw a man peering through her blinds. It was Cam Newton wanting to make good on a promise. In the fall of 2010, Newton regularly volunteered at Wright’s Mill. He last visited that December before leaving for New York to attend the Heisman Trophy ceremonies. The faculty held an assembly in his honor. “Cam Day,” they called it. Tremaine said today’s visit was a special visit to the four boys Newton regularly mentored and has kept in touch with since leaving Auburn. Tremaine said Newton has a personal assistant who calls the school to check on the boys. Even the student with the Alabama shirt. “He (Newton) pointed at him and said ‘this guy’s just confused,'” Tremaine said. Newton then picked him up and put his hands over the boy’s ears. “He said, ‘I want y’all to say ‘War Eagle,’ but I don’t want his ears to hear it. I want his heart to hear it,'” Tremaine said. 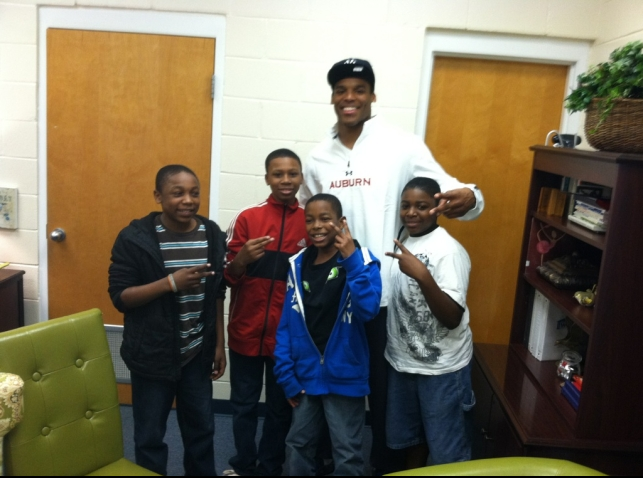 Related: Cam Newton returns to Auburn—hungry. Oh the heartmist. He’ll always be our Cammy Cam. He has great reason to be arrogant but he is not!!! He is a great guy living up to a promise he made at Auburn!! If you can’t say something nice just keep quiet swha !!! I caught the sarcasm Swha, no worries hah.. I understood the sarcasm, too, swha. And, yes, he will always be our Cam.